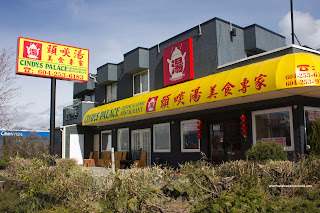 Ah yes, I remember Cindy's Palace. This is the place my mother-in-law refused to do a re-visit. There is a story behind this. You see, she had asked Viv to go out for Dim Sum one day. Instead of going to her standby (which is Fortune City - not that great by the way), she wanted to go somewhere different. Viv pleaded with her to not go somewhere new since I wasn't available to go. That way, we could all go to that "new" restaurant together. Nope, no can do, she insisted on going to Cindy's Palace, which incidentally is run by the former owners of Golden Phoenix (now Phoenix Garden). However, she assured Viv that she would gladly go again so I could try i t out. Then on the day we were all supposed to meet up for Dim Sum, she suddenly had a change of heart and insisted we go to Fortune City! WTF? Her rationale? Cindy's was "meh". And Fortune City is good??? I swear she is bi-polar. 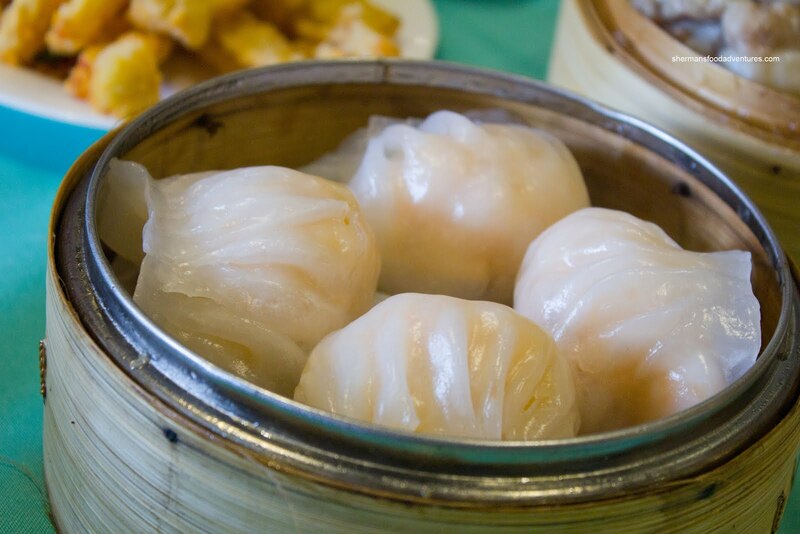 Well, not trusting her thoughts about Cindy's, we made plans to go for Dim Sum with Guy Smiley and Girl Smiley to see for ourselves. We arrived a touch past noon on a Saturday and of course there was a lineup. It wasn't bad though, only about 5 parties deep. Unfortunately, when we did get seated, it was the table right near the entrance. To say the seating arrangements were tight would be a huge understatement. The table right next to us couldn't get out unless one of us got up. To further complicate things, they do it ol' skool here with push carts. Consequently, we got our food almost all at once which completely cluttered up the table. I guess we could've not ordered everything, but c'mon, how could we resist? 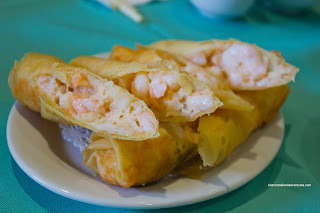 The first thing I took a picture of (yes, only picture-taking, no eating for me until that is done) was the Shrimp Spring Rolls. These were cut diagonally and plated nicely. It is hard to tell from the picture how big these really were. These were easily 1/2 times longer than most typical spring rolls. Furthermore, they were bursting at the seams with filling. It was a mix of chopped shrimp and mousse. The rolls were crispy and not greasy. Pretty good overall. Next was the Blackbean Pork Spareribs which were on the chewier side. They were mildly seasoned with a predominant garlic flavour. The pieces were mostly of the rib variety with only a few that were cartilage. These were not bad. Something that was sorta bad was the Fried Squid. The darn things looked lifeless and unappetizing. And with one bite, yes, they were pretty awful. They were chewy and hard with a dense batter. There was hardly any flavour or spice. Only good thing about them was the lack of grease. Although I suspect that the batter merely soaked up the grease while the plate sat around getting cold. carefully. The dumpling skin was a touch firm whereas the shrimp filling had the proper texture. It was "bouncy" and had a nice snap. It could've used a touch more seasoning though. 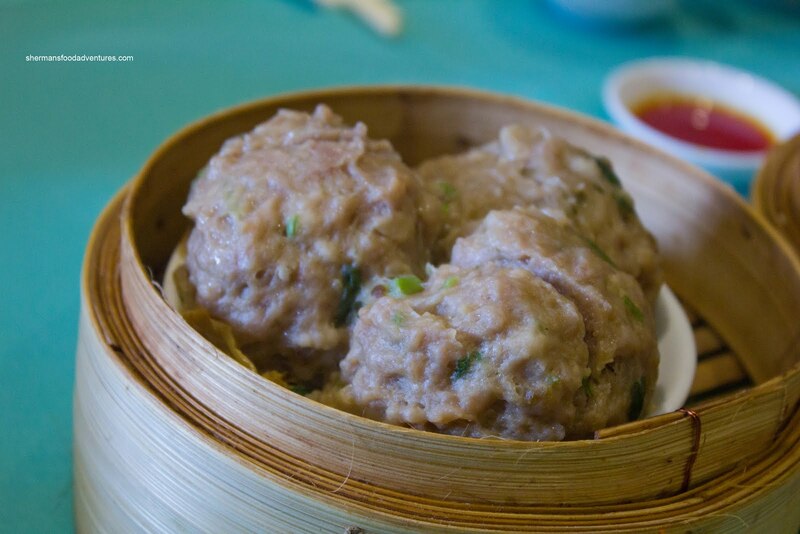 The Beef Meatballs continued the enormous theme as they also barely fit onto the sauce plate in the bamboo steamer. These had a good bounce texture where the meat was tenderized without becoming mushy. 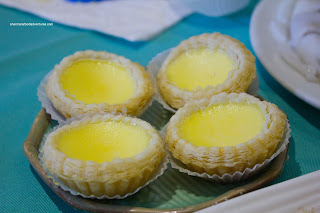 In addition, they were balanced in flavour where it was neither too salty nor too sweet (and just enough green onion). 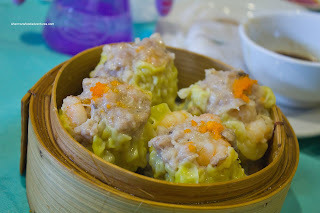 With the 2 large portioned dishes we just had, it was no surprise that the Sui Mai (pork & shrimp dumpling) was equally big. Again, these were crammed into the bamboo steamer and were actually stuck to each other. Unfortunately, much like Ron Jeremy, the only good thing about these was its size. First of all, the pork was over-tenderized and soft. Furthermore, the entire dumpling was loose and practically fell apart after the first bite. To top it all off, the shrimp didn't have a snap to it (albeit they were large whole shrimp). It did have a decent flavour though with a good mix of sweetness and savouriness. Moving along to a non-gargantuan item was the Beef Rice Noodle Roll. The rice noodle itself was thin and soft without losing its structural integrity (did I just say structural integrity in reference to food?). Also, the beef filling was tender while retaining a meat texture. 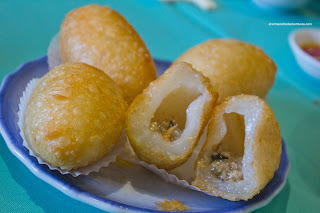 Something that we don't see that we don't really order anymore are the Fried Glutinous Rice Dumplings. It's not that we don't like them (in fact we love them), they are just not that healthy. Usually, these are pretty greasy since the glutinous rice flour absorbs a significant amount of grease. But with push carts coming around with them, well... resistance was futile. These were actually not really that greasy and were crisp and had a pleasing texture. the one thing we would've liked to see was just a bit more of the well-seasoned and non-gritty ground pork filling. 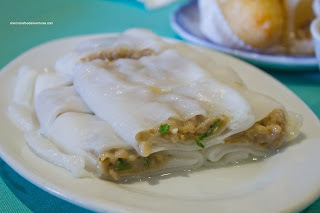 For some strange reason, the Soy-Fried Rice Noodle Rolls were nowhere as good as the steamed ones. These were very greasy and not all that appetizing. Yes, the colour was decent due to proper pan-frying and use of dark soy. However, the rolls themselves were hard, mealy and lifeless. Oh well, at least my son ate them. 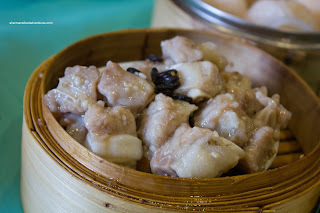 For once, we didn't order any offal, which made me feel offal (LOL... Sorry bad pun). On the other hand, we did get the Phoenix Talons (chicken feet), so the "odd food to some" quota was maintained. 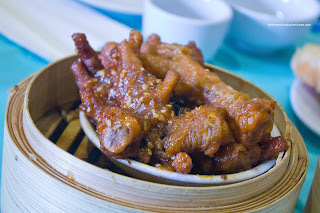 It was too bad that these chicken feet were pretty average. 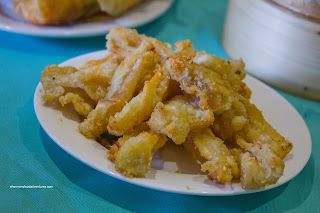 Most of them were not fried enough, so they were hard including the cartilage and gelatin underneath the skin. 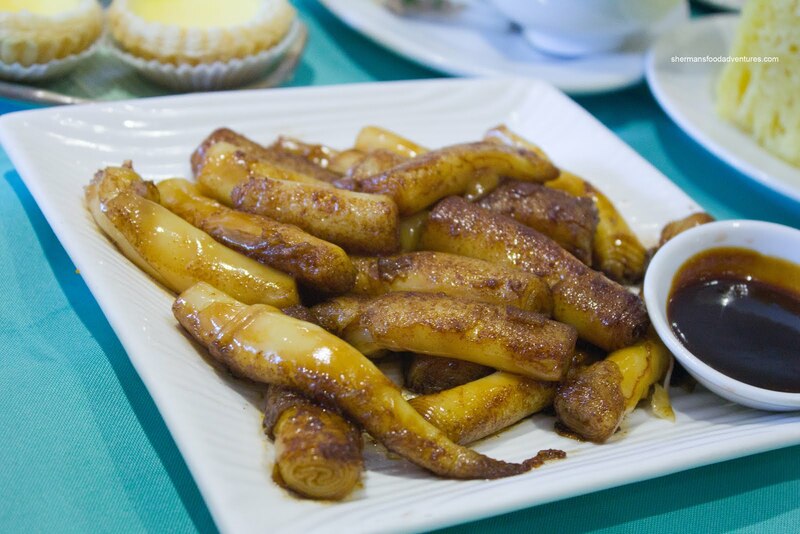 Therefore, it was hard to eat and really not appealing texturally. At the very least, the flavour was pretty good with lots of garlic. Given the amount of dim sum places you have visited, at this point, can it be safe to say that, even the not-necessarily-good ones provide a better value than taking your family to say, IHOP, Cora's or Denny's for breakfast? 10 points to Sherman for being able to work a Ron Jeremy reference into a dim sum review. Would've been more had you been able to link it to te beef meatballs! @KimHo In Vancouver, it is easy to find Dim Sum in varying degrees of quality. Naturally there would be a whole bunch in the "average" category which would otherwise be awesome everywhere else. I would still go to these places as they provide good value. But if I could go to a better one, I would do that too. @La Generalissimo Thanks! With all the balls, tongue, feet and what not, it's actually easy to make a Ron Jeremy reference. @alee Well, if you met her, you would rant too! How would you compare the current reincarnation with the former Golden Phoenix, food-wise ? @LR I think the food is pretty much the same, but the portion size is pretty large. Good value.